Smaller-capitalization stocks and value stocks fared even worse last year than the overall stock market. International stocks continued their streak of lackluster returns. Whether this is normal volatility or the start of something more significant remains to be seen, but so far what we have experienced is not unusual. Since 1987, the average returns for the S&P 500 have been 11%, but the average intra-year drawdown has been 10%. The downturn we just experienced was higher than that, but not unprecedented. The market was down 18% at one point in 2009, but ended the year up 26%. 2011 saw a 16% drawdown, but returned a positive 2% for the full year. Since 2011 the market hasn’t experienced intra-year declines of any particular note, which is likely why the fourth quarter of 2018 seemed abnormal. As we noted in our emailed communications over the past few weeks, we can’t come up with a good reason for the recent market turmoil. Yes, interest rates have been rising and valuations have been relatively high for certain market segments. But the economy is still quite strong, interest rates remain historically low, inflation is tame, corporate earnings are robust, and most importantly, unemployment is at very low levels. Both the corporate and consumers sectors remain healthy. An economic slowdown may be underway, but it is far too soon to declare that with any authority, and the risk of an all-out recession seems remote for at least another year. Changing investor sentiment seems to be the real reason for the stock market’s downturn. Nothing else was really different from the peak of the market last September to the trough in late December. The good news is that the market has already started to recover. No one knows for sure whether more turmoil will ensue, but it seems that cooler heads are prevailing, at least for the moment. There is good reason to believe the recovery could continue. As mentioned above, the fundamentals of the economy and corporate America are sound; stock market valuations are now much lower than before, and there is historical precedent for a rebound in returns. 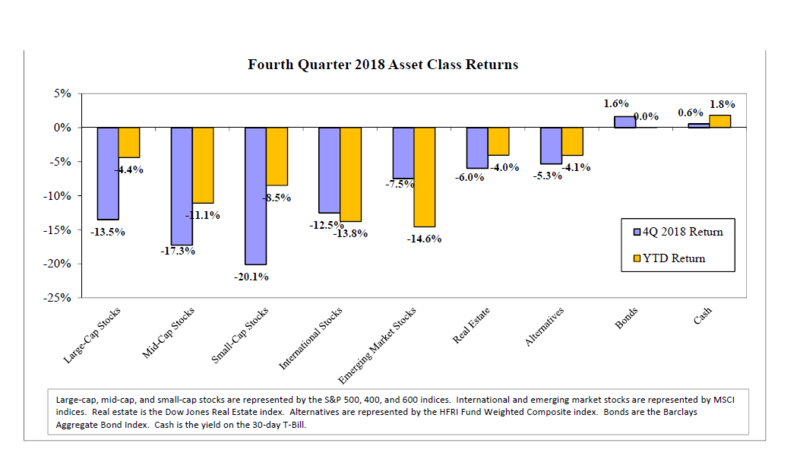 While the fourth quarter posted the 12th worst returns in many years, the 11 worse periods were generally all followed up by solid recoveries. In each instance, except one, the market was higher 12 months later. In every period, stocks were higher three and five years later. And, the subsequent returns weren’t just modest recoveries. Returns were generally well above average in the wake of these market downturns. We can’t say for sure that history will repeat, but for those invested for the long haul, it seems reasonable to believe that today will look like a buying opportunity when viewed a few years in the future.